I hope you all had a great weekend. Ours started with a visit to B&N on Friday. 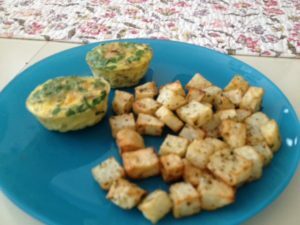 I found a new historical mystery book, Whispers Beyond the Veil by Jessica Estevao and I also found an easy recipe for veggie frittata muffins that we made the next day. My husband made enough for eight muffins so I was able to save a couple for my breakfast this week. Sorry for the blurry picture but I was hungry and wanted to get to my food. Hee. We also watched Me Before You based on the book by Jojo Moyes. I really liked the movie. Of course the book was better but I still enjoyed the movie. Have you seen it? What did you think? Other than that I spent some time dipping into various books and I finally started working through Drawing and Painting Beautiful Faces by Jane Davenport. I’ve only started the first exercise which guides you through the steps of drawing a happy face. I particularly enjoyed the suggestion of smile as you draw. My first attempts were in pencil even though the author suggested to just go with a pen to avoid spending time on perfecting things but after the first few attempts I did switch to a gel pen. I don’t think I picked up the best gel pen for this exercise but trial and error, right? Anyway, that’s a bit of what I was up to. How about you? And, this week is Banned Book Week. Are you reading anything “dangerous”? I hope you are! I don’t think I have any challenged books on my nightstand but maybe I’ll manage to add one before the week is out. I still haven’t watch Me Before You. I suppose I’m a bit worried how the film will turn out to be; after all I enjoyed the book so much but I’m glad you enjoyed it. sounds like you had a lovely weekend. too bad they are always followed by Monday! Melody – They were so good! I hope my husband makes them again. I think I enjoyed the movie because I had read the book a couple of years ago so it wasn’t fresh in my mind. There were differences of course but it was cute. Stefanie – I know right? How is it possible that the work week seems to last like two weeks and weekends fly by?! Not reading any banned books at the moment, although I just abandoned one that should be banned for poor writing. Those muffins look delish! Nope, not reading any banned books right now. Barely reading anything at all! 10 minutes before falling asleep every night is about all I’ve been able to manage for the past week or so. I read Me Before You and I’m eager to rent the dvd. I know it won’t be as good as the book, but I hear it’s still worth watching.